Chick Hearn called it "nervous time" -- those last minutes of a game where tensions are high and either team could win. Last night, the whole game was nervous time. The Lakers trailed by double digits in the second half and somehow turned it around for a come from behind championship win over the dreaded Celitcs. My Laker allegiance goes back to when the Laker big men were named Rudy and Mel instead of Shaq or Pau. For me, the finals against the Celtics have been equal parts joy and fear. Joy of the thought of another championship. And fear of yet another loss to Boston. Yesterday's Times captured my mood. Heisler wrote about the Lakers' '69 loss to the Celtics in game seven. Plaschke couldn't get away from "nagging twinges of doom." Me too. I got those twinges of doom even in the first minute when Kobe drove the lane, was mugged, and no foul was called. It was clear the refs would only call the most egregious fouls and that favored the Celtics. It also promised an ugly low scoring game, which is what we got. Kobe never got on track, made just 6 of 24 shots, and missed free throws to boot. The rest of Lakers team were the heroes -- Fisher, Gasol, Odom, Sasha. The enigmatic Ron Artest played an incredible game. And, right after the game, Artest made NBA finals history by becoming the first player to thank his psychiatrist on national TV. Local postgame coverage on KABC Channel 7 was absolutely terrible. Instead of reporting on the celebration inside the Laker locker room, KABC focused on the crowd outside of Staples Center and on a few stupid incidents. There was helicopter coverage of the foolishness and several reporters on the street. They trumped up as much unrest as they could, glorified the drunken fools and repeatedly interviewed the police. About the last things I wanted to see after an historic Laker win. Recently the "toy department of human life," has offered up a lot to ponder. That's especially true for this lifelong LA sports fan. We've got the Lakers-Celtics again in the NBA finals and the NCAA's ridiculous sanctions against USC football. We've got the US tying England in soccer. Then, in a whole different category, there's the passing of John Wooden. I grew up a Laker, Dodger, Ram and Bruin basketball fan. Back then, UCLA basketball was just amazing to watch -- the stifling full court press, Kareem, Walton, and the rest. Ten NCAA championships in a dozen years. Nothing like it before or since. But, as dominant as UCLA was in the 60's and 70's, you always knew there was more to those teams than just basketball. 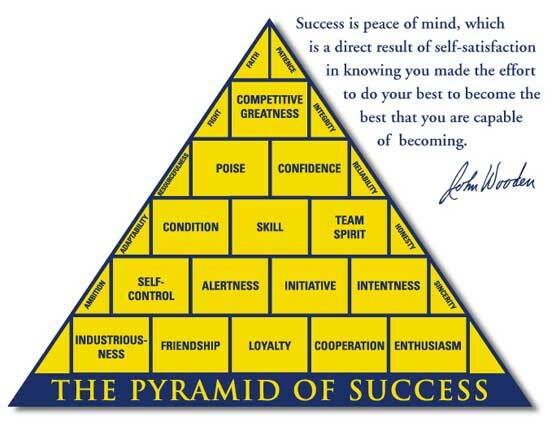 There was the person and the teaching of John Wooden. 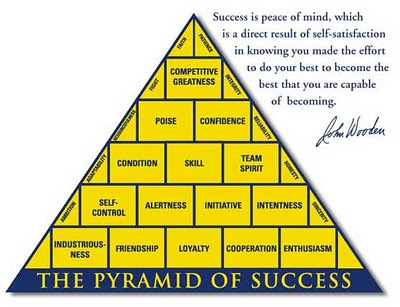 Coach John Wooden died June 4 at the age of 99. He coached his last game in 1975, yet what the man taught was so enduring and so compelling that 35 years after his retirement his death was front page news across the nation. By "the numbers," he ranks as one of the greatest coaches of all time -- regardless of sport. But, remarkably, almost all of the buzz (and there's been a lot of it) is not about basketball. The Internet is filled with story upon story of Wooden's teaching, his upright life and his devotion to his wife, Nell. Wooden's life began in 1910 in a house with no indoor plumbing and it ended this month with his life and his teaching splashed across the World Wide Web. Through it all, he was guided by a seven part creed given him by his father, an Indiana farmer. Kind of bedrock rules for living, the creed stood the tests of time and place -- from Wooden's schoolboy days in Martinsville, IN to Westwood in the tumultuous 60's and they anchor his legacy today.